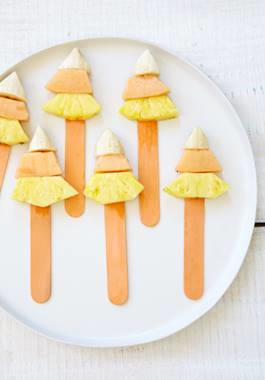 Of course, Halloween is all about the candy, but that doesn’t mean that it’s all your kids need to eat on the big day. This year, you can keep them properly fueled, while still serving up the spooks, with the below healthy snacks. Try them after school, after trick or treating, or as Halloween party treats. And since all of these are easy to create, kids can help with the assembly for a fun family activity! The following Halloween party recipes are courtesy of Terra's Kitchen. Choose one of each color fruit. Cut progressively larger size triangles and thread onto lollipop sticks to look like oversize candy corn. Served chilled. Carefully peel kiwi with a vegetable peeler. Cut off a small lengthwise piece (the belly of the spider) so it sits flat on a plate. Break mini pretzels into curved pieces and insert 3 legs on each side. Carve out little indentations for eyes and serve. (You might also try raisins or chocolate chips, if you can figure out a way to make them stick!). 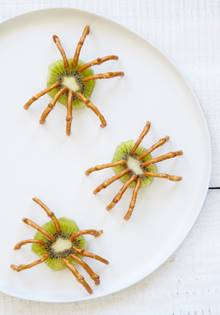 I love both of these recipes , but the spiders are my favorite. Perhaps after making 2 small holes for the eyes you can partially split a raisin and insert it so each half is on one side of the kiwi.